Last weekend I celebrated my third (wow!) birthday in India. I turned 27 in Delhi when we made our very first "look-see" trip to India. Now it's officially two years since we made the decision to move here, and honestly despite all my complaining, I don't regret it for a second. Things aren't always easy here. There are days that are great and there are days where I have total meltdowns (as seen in this post). Going to Elefantastic was a great reminder of why we came here in the first place. This was an experience that I couldn't get back home, and it was truly a birthday to remember. We have known about this place forever. Our other expat friends who live in Delhi have been here twice and raved about it. Matt and I have had intentions to go forever, but were trying to spread out our touristy things. I was also skeptical that it wouldn't be as advertised. But to my surprise, it was exactly what I hoped for, and surprisingly exactly as described on their website and on TripAdvisor. Very refreshing when often times nothing is as it seems. 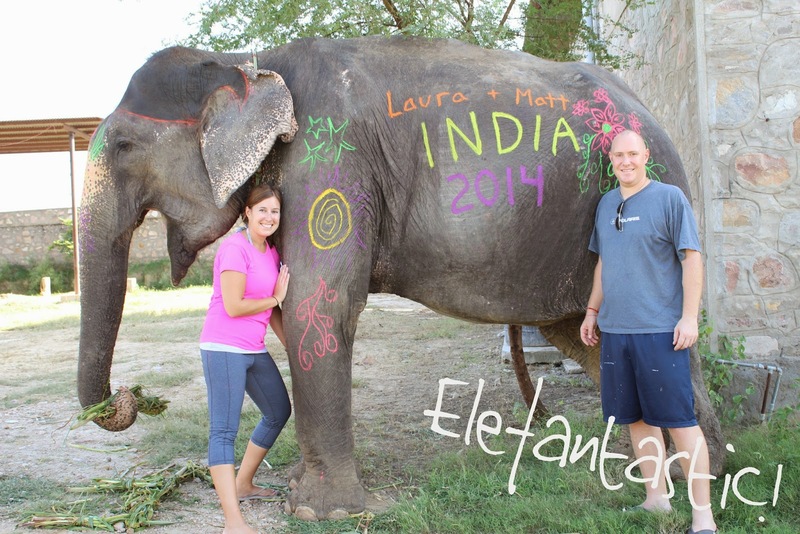 Elefantastic is owned by a young guy named Rahul. 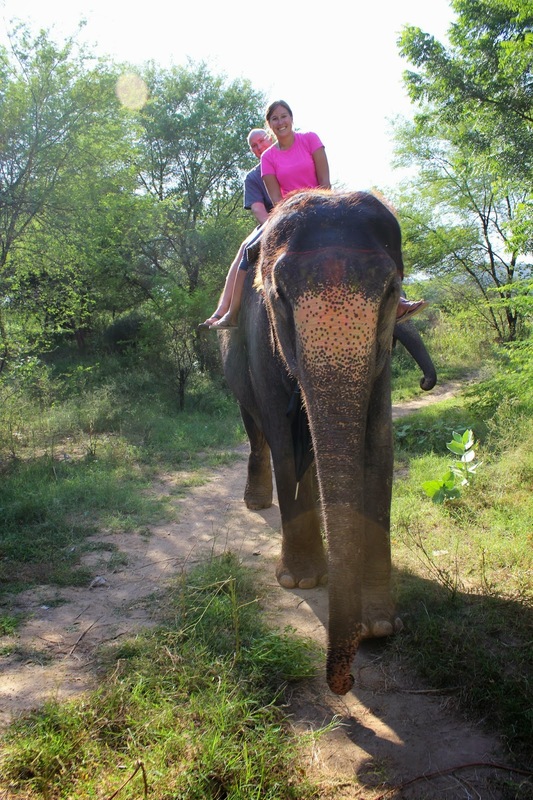 He used to ride elephants at Amer Fort (I wrote about that post here a year ago)! However, he wasn't approving of the way the elephants were treated. He created this place where the elephants have plenty of space, are well taken care of, and they don't use the hooks to poke at them which they use most other places in India. There are about twenty female elephants and one male. Each one has a full-time caretaker, and that person along with their family live on the Elefantastic grounds. When we arrived, we got acquainted with our new friend for the day, Sampa. 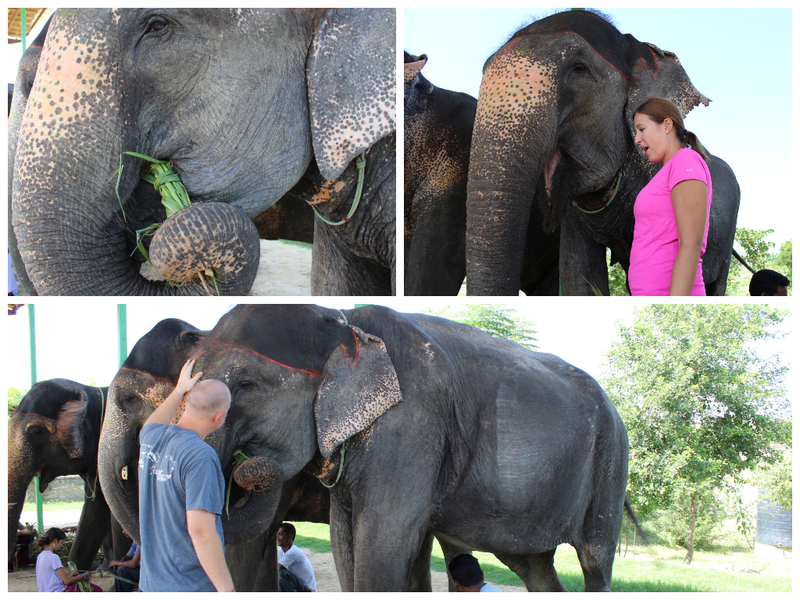 Sampa was a very gentle elephant. Some of her friends were a little rowdy, so I was glad we had her. The first thing we did was feed her. She got to know our smell and trust us because we filled her belly! After we fed her from a never-ending pile of "grass" stalks, we were taken to lunch at Rahul the owners home where his mother prepared a nice veg meal. After lunch we came back for a short ride on Sampa. While on our walk, we saw some elephants cooling off in the lake that was made just for them. I had no idea that an elephant could kneel like this! This is how we got off of Sampa. After our ride, the elephants took a break and ate some more. Apparently all they do is eat. Here is the one huge male elephant who also came out for a snack. 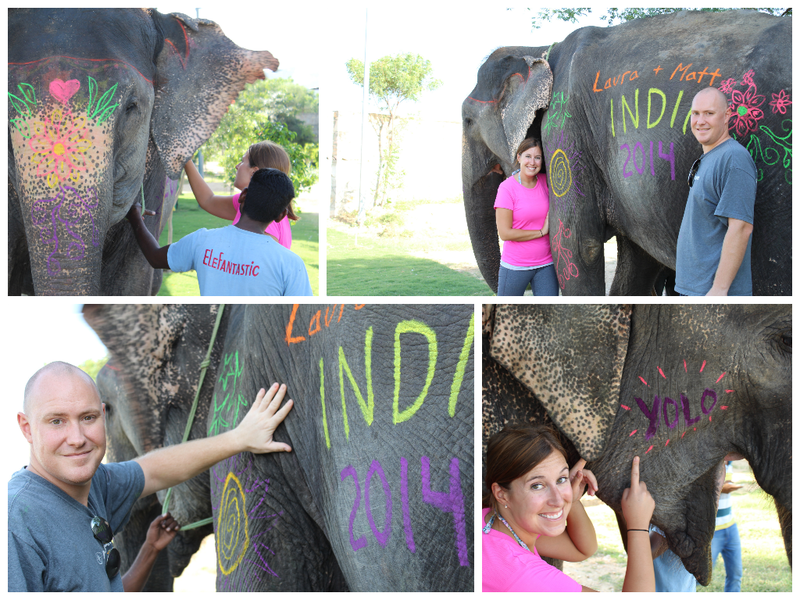 After their rest, we got the paint the elephants! 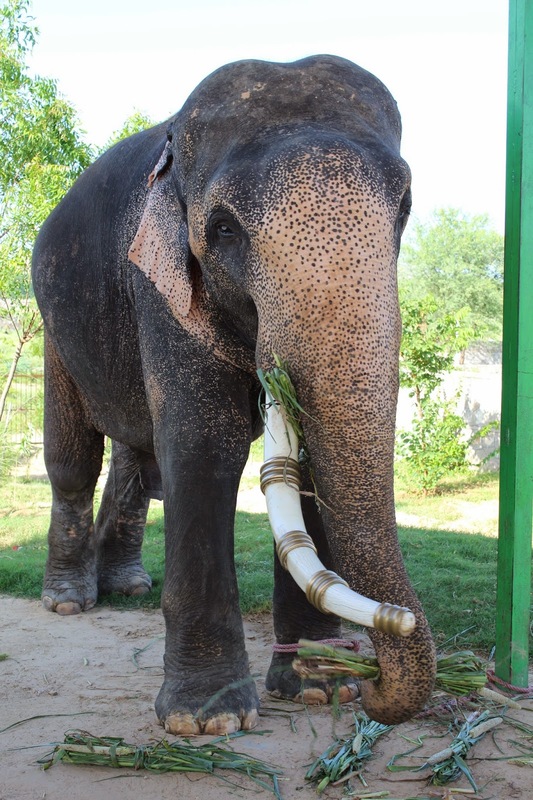 Elephants are often used, especially in our state of Rajasthan, for celebrations and holidays. 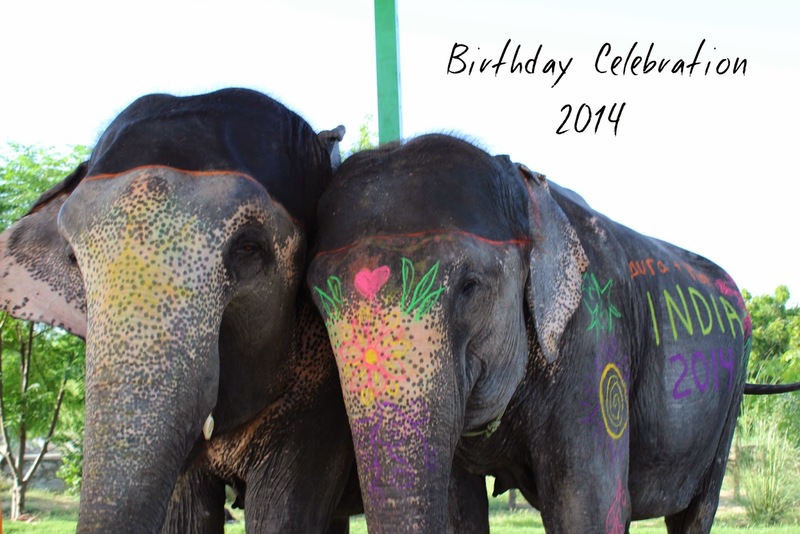 During these celebrations the elephants are painted in traditional patterns. Our painting wasn't very traditional, but it was really fun! Sampa was very still and patient with us, eating away while we painted. I thought painting Sampa was pretty awesome...but then we got to bathe her! It's a shame my eyes aren't open in this picture. Let's just call it an action shot! We scrubbed, or "massaged" Sampa to remove the paint, and she certainly had plenty of water to drink. After Sampa's bath, she went to eat some more and hang out with her friends. I was drying off and packing up my camera but was soon surprised to see that Matt had arranged with Rahul for a little birthday celebration! They had made a cake we all got to share. 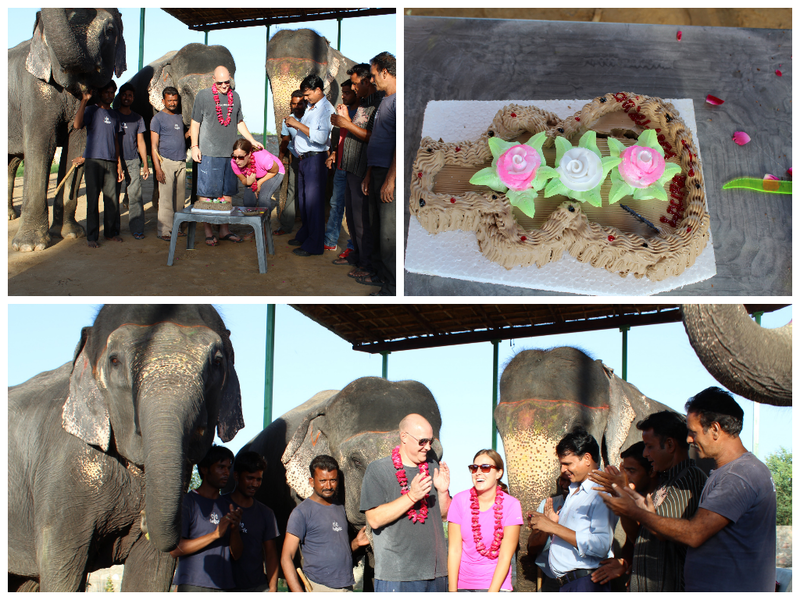 It's not every day you get sung "Happy Birthday" to, while surrounded by elephants! Elefantastic was seriously just what Matt and I needed. It was a reminder that despite the challenges of living in a foreign country, there are certain experiences that make it all worth it. *I recently added a Facebook "Like" button to this blog. If you're interested in getting notifications for my latest posts, then "Like" this page! Laura Happy belated birthday! I just saw your blog. It is very nice. The all pictures are showing your birthday celebrations. Sampa is looking quite friendly and polite elephant. Your birthday cake is looking so yummy. I wish I would have there. You know recently I came from Delhi after my thousand islands niagara falls tour. It is a very pretty and busy place. I would love to go there at least once in my life. A very HAPPY BELATED BIRTHDAY. May God bless you.